Add a pop of color with our Massachusetts Pink Value Notary Kit. This pink supplies kit comes with the essential products that every Massachusetts Notary Public needs. Some of your products require information that is specific to that product. Please complete all relevant information for each product. 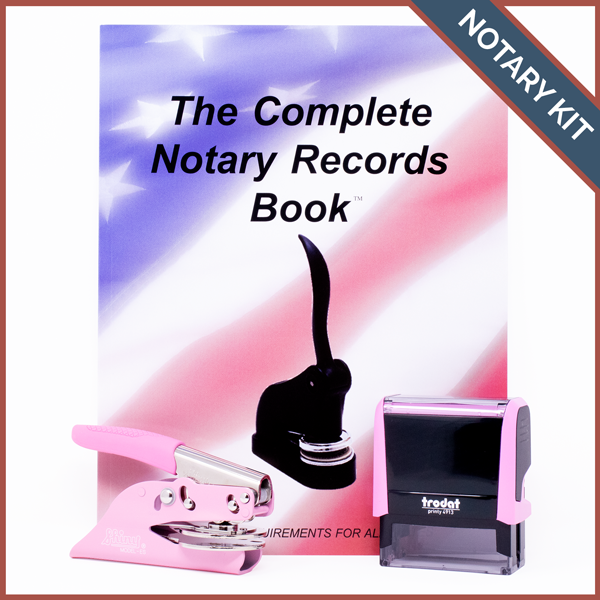 We carry the latest Massachusetts-recommended seals and stamps, and our Massachusetts Pink Value Notary Kit contains the essential products you need to notarize documents, plus a handy records book. If you aren't sure what you need, be sure to contact our Customer Focus Team or read our FAQs to ensure you order the correct Massachusetts seal or stamp. Our stamps are available as self-inking, pre-inked and hand stamps, and our embossers come in handy pocket styles and desk models. © 2019 All State Notary Supplies. All Rights Reserved.